The Temecula CA based trio I, Us, & We had its audience entranced and seduced at a recent show on November 16 at The Sayers Club promoting its first EP release Ceremonies on the emerging and progressive indie music label Little Assembly. The concertgoers were mesmerized and in a hypnotic state dancing to the music. If you are a fan of dream pop, I, Us & We is a must-see band featuring the sonic and creative talents of brothers Jordan, Evan and Aaron Doverspike. Their unique sound combines indie rock, electronica and R&B with synths, programmed drumming and three-part harmonies. 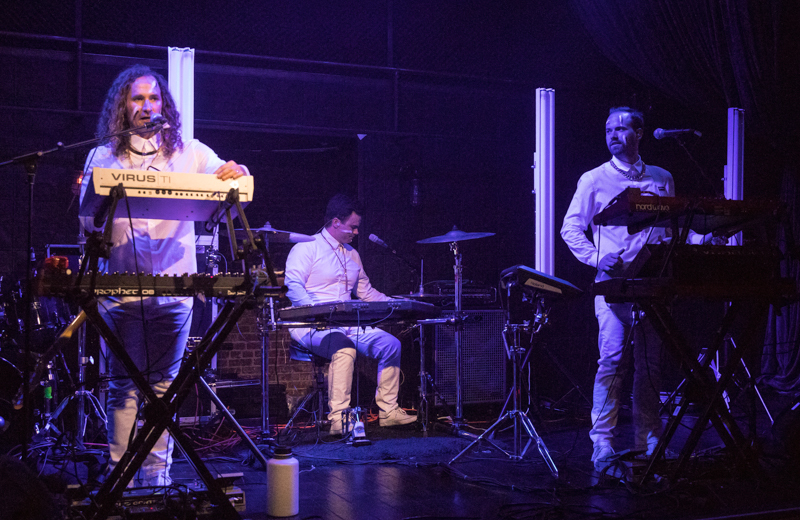 Dressed in all white clothing against a backdrop of multi-colored flashing lights illuminating from the stage, I, Us & We made quite an impression with their visual presentation. Unfortunately, it was the same lighting, that was often too distracting and overpowering, that took away from what could have been a thoroughly enjoyable experience merely watching the band as they sensually lured the throng with their sinewy, striking and stark rhythms. The vocals, though strong, varied in intensity, strength and dynamic impact. One’s attention tended to drift depending on which singer commanded the lead mic and brought the audience back to a state of being fully present at the show. Having already performed at The Troubadour, The Echo, The Satellite and Echo Park Rising, I, Us & We are clearly on their way to bigger things now adding this notable show at The Sayers Club where the trio was a hit with their receptive and attentive fans enthralled by the musical package the band had to offer.